My earliest childhood memory is 1969 standing in my parent's living-room late one hot summer night watching as the Eagle spacaecraft made it's final approach to the surface of the moon; oddly, Neil Armstrong stepping out and walking on the surface isn't as clear in my mind's eye except for later replays ( it was well past my bedtime after all). But the excitement that was in the air that night, I'll never forget, At the time of course, I couldn't comprehend the significance of the event and it wasn't until years later, watching JFK's "We Choose the Moon" speech from 1962 that I began to understand what a defining moment it had really been. It has to be one of the best motivational speeches of all time; a promise to make good on an almost insurmountable task, with technology that still hadn't been invented, all within a ridiculously short timeframe. It's what made Americans great. I would watch many more rocket launches in the years after that, including the first launch of the Space shuttle Columbia as a teenager in highschool- I skipped class for the first time that day to watch the launch live and later squirmed in the vice principal's office as I tried to explain why I felt watching a rocket launch on TV superceded my obligation to attend classes. I suspect it takes a lot more these days to earn a trip to the principal's office. STS-133 will be the last launch of the space shuttle Discovery and the third last launch of the space shuttle program, so I've booked myself a flight and am skipping class (actually, work) one more time to watch it in person. If you don't have tickets for a Shuttle launch viewing, then Titusville is the best place to watch a shuttle launch from, in fact, one of the more famous photos of a night shuttle launch was taken from a little Cuban restaurant in Titusville called Leoncita which I believe means little lion. The photo framed a spectacular night launch with the hotel's now signature electric palm tree in the frame of the shot. 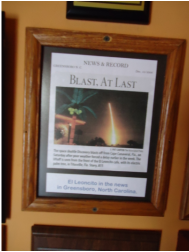 I've seen lots of really cool shots of shuttle launches so I'm not sure why this one in particular went viral, but the owners proudly display numerous stories about the photo in their front foyer along with numerous signed photographs of various astronauts who I presume have eaten there over the years. If you happen to go to Titusville for a launch, the food is quite good and numerous locals confirmed that it is the best restaurant in town, and with a clear view of the launchpad across the river, a great spot to watch a rocket launch. Sadly, it seems that the culmination of the shuttle program will have a huge effect on the local economy-one local who owns a barbershop across the river from the launchpad mentioned that 600 people employed at the space centre would soon lose their jobs- i had stopped there to grab a quick haircut while I waited for launch time but unfortunately, the owners had closed shop early since the prospect of renting out their parking lot at $10/car was going to earn them more than the number of haircuts (at $10/cut) they could potentially perform by the end of the day. Although a little disappointed that I wasn't going home with a new do, I was heartened by the insider information the owners supplied that the launch was definitely going to go (the barber had relatives working at mission control). Somehow, Titusville's Chamber of Commerce failed to anticipate ther potential financial boon that a final shuttle launch (or subsequent future launches for that matter) could provide for their small town. Given the traffic gridlock that follows a rocket launch anyhow, I think it would not be unreasonable to shutdown the road directly across from it before the launch and make it into a more organized event-many of the launches never actually get off the pad, but it might be not quite as disappointing to all of the international tourists if there was, say an airshow prior to the launch along the waterfront-there's even a warbird museum with flying planes just down the road that could probably also benefit from participating in the event. And what about T-shirts, posters, badges and the like? Only a few enterprising individuals who'd made some up themselves, amongst what must have been a million tourists could be found selling their wares in the hours leading up to the launch.. Somehow, someone forgot that a shuttle launch (and especially the last one) is the equivalent of a Superbowl event for aviation nuts like myself. Or maybe it was too much of a bittersweet moment for Americans who now face the humbling prospect of piggybacking into space on Russian rockets-maybe no one really wanted to celebrate. I arrived well in advance of the launch and In the absence of any formal viewing area along the riverfront,,plunked myself down under a small tree in front of a gas station so that I could quickly grab refreshments when needed-plenty of other people adopted the same plan-crowding under the gas station canopy such that any hope the gas bar owners had of selling any fuel were quickly dashed.,, The build-up to a launch is inherently exciting-a local school teacher with the mission control frequency dialed in, piped it through the speakers of his Goldwing cruiser so that anyone within 50 yards could here the sing-song call and answer protocol that the launch commander follows as each of the team leads verfies that, yes, their systems are ok for launch. At ten minutes, the launch goes into an automatic mode and the anticipation within the crowd is palpable. On this occasion, with five minutes to go, the launch was placed on a two minute hold while technicians scrambled to fix a glitch in one of the computers-if the two minutes expired without resolution to the problem, the window of opportunity for launch would expire and the last flight would have to be scrubbed once again.Not to mention the fact that I'd be out $1000.00 to come down and watch-total wasted cost for STS133, one billion and one thousand dollars. I can't imagine what it would feel like to go to work, (with one million people watching you from the side of the road) and discover that if you can't reboot your just-crashed computer in the next two minutes, you'll have just crushed the pride of an entire nation, and you may have hammered the final nail in the coffin for the project that has employed you and your coworkers for the past 30 years.. Bummer.. I think the crowd probably cheered as loud when mission control announced that the problem was resolved and the launch was indeed a go, as when the engines finally ignited and the Discovery lifted off. My father, before passing, had asked me a number of times during my teens to go and see a launch, but for reasons I no longer recall, I didn't take him up on it, so when the moment came and the roar of Columbia's engines reverberated across the river, it was a much more emotional moment than I had anticipated-for a moment I was taken back to that night over forty years earlier, watching the moon landing in my parents livingroom, and experiencing the thrill once again of a historic spaceflight. a typical lifetime for a space shuttle tire before changing is 60 seconds of use. Famous shuttle launch neon palm tree to the right. Famous night launch photo at the Leoncita. Notice the fake palm tree shown in the photo above. A more optimistic viewpoint for the future of American space travel on a billboard that lies adjacent to railroad tracks used to carry rocket components to the VAB at Kennedy Space Centre. Many of the staff there have already lost their jobs as the shuttle program winds down. Beautiful weather as launch time approaches. Cool link to a 360 degree shot of the space shuttle cockpit.